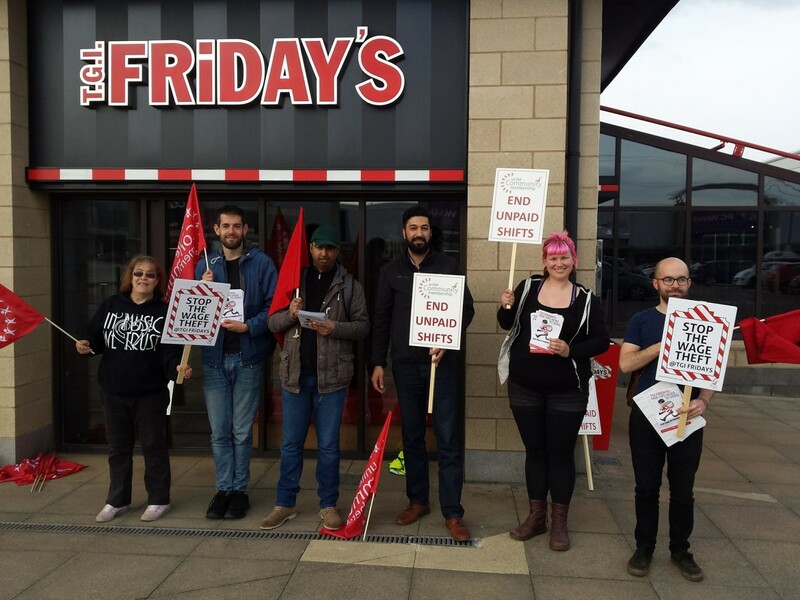 18/05/2018: Members of the Bradford branch of the IWW came out in Solidarity with TGI Fridays staff striking over the companies decision to reduce the amount of money they earn from tips by 40% through redistribution to back of house staff. In February, TGI’s management decided to change how tips – collected via Credit and Debit Card service charges – were distributed, with back of house staff now receiving a share of the total tips collected. With the move to customers now using cards more frequently to pay for their meals, waiting staff are relying more heavily on those tips collected via card than they previously were. Workers for the chain state that the reason the company has made this change is due to increases in the minimum wage – increasing the amount the waiters earn – which has reduced the differential between front and back of house staff (who traditionally haven’t taken a share of collected tips). Back of house staff are also said to be unhappy about the change, stating that a raise in the basic rate of pay is preferable to receiving a share of the tips collected. This move by the company is a blatant attempt to avoid paying their staff a fair wage, instead seeking to take from the front of house staff to pay the back, and on the 18th May, members of Bradford IWW turned up to the chains Birstall restaurant to show their solidarity with striking TGI staff. The IWW considers the movve by TGI’s a cynical way to avoid having to pay its workers a fair wage – instead using customers tips to ‘top up’ their staff’s pay. We say reverse the decision, pay a proper wage and stop stealing from your workers! !